Join Blog widget is a very basic plugin. It allows you to enable your users join various blogs on a multisite install of WordPress. 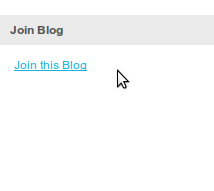 It simply adds the users to current blog if they click on Join Blog link. I created this plugin to act as a companion for our other plugin, the BuddyPress Multi Network Plugin. You can encourage your users to join various networks on the Mutisite install using this plugin. Here is a couple of screenshots. This is a free plugin and I hope it helps some of you in building your network. Please help us in improving this plugin by providing your valuable feedback in the comments section. Thanks. We were looking for the same. Perfect for our website. Hi Brajest, I added this and have added the widget to all my blogs (I call them Team Sites as all my buddypress subsites are all for teams) … I go to the team sites after registering on the main site and I click to Join, it confirm all ok. I then click on my profile and my sites, shows zero, the admin bar at the very top doesn’t show sites I am a member of (admin has all the sites listed there). I’m running wordpress mu with buddypress, very latest version of all. Excellent plugin idea. We are running a WPMU with Buddypress. Not a Multisite Buddypress, just a single on main, but are offering blogs. This plugin look like it adds the user to Sub blog but does not hook into the Buddypress functionality for say activity or other. For instance, we are running BP Groupblog with the External blog option. Can you provide a Join Group Blog button that would hook into the group settings and permissions. Thanks. I am testing out your Join Blog Widget on Buddypress (thank you for creating it by the way). But, it seems to be causing an error with another plugin I’m using. I’m using Custom Admin Bar (http://wordpress.org/extend/plugins/custom-admin-bar/). I use Custom Admin Bar to hide a few things (on the admin bar) from users when they login (menus). And that works fine. 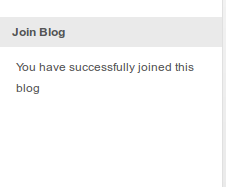 But once a users uses (“joins”) your Join Blog Widget, the menus return. Any idea how I could fix this? I am sorry for the trouble. I don’t see any reason for the problem. which menu items are not hidden when the user joins the site ? The problem doesn’t arise when a user joins the site. The problem occurs when a user “joins” a blog using Join Blog Widget. Initially a user won’t see the the My Sites menu and the Site Menu. But after using the Join Blog Widget, those menus return. Please ask the custom-admin-bar plugin developer that it is not working for subscribers on the sub blogs. They should be able to help you in much better way. Sorry to bother you again, but if you get a chance, can you please look into the problem I’m having, and offer your expertise? I’m working with Buddypress on Multi Site and I’ve encountered a problem. On a subsite I created a while ago, on the Join Blog Widget (under roles) I can add a new user while assigning their role as: Admin, Editor, Author, Keymaster, Member, Blocked, Inactive, etc (mostly, just like in the your pic here: https://buddydev.com/files/2012/03/join-blog-widget.png?84cd58). But on another subsite I created today, on the Join Blog Widget, the only roles I can assign to a new user are: Subscriber, Administrator, Editor, Author, Contributor. I’ve created other new test sites today, and I’m still getting only those 5 roles. Do you know how I can fix this/what error I’ve made? It seems on one of the sites you are using bbpress plugin which is adding the extra roles while on other site, the plugin is not active, so default WordPress roles are visible. There was a blog post by you much before the release of this plugin that explains how to use the hook to add users automatically without the plugin. Unable to find it now. Can you link it here? I love the idea behind this plugin. But as I pointed out in the forums, it behaved strangely for me. I am confident you will iron this out soon enough. As explained in the forum, The new release is working fine.